Alzheimer’s is the sixth-leading cause of death in the United States and the only cause of death among the top 10 deadliest diseases in the country that cannot be prevented, cured or even slowed. Mortality data show that death rates have declined for most major diseases, while deaths from Alzheimer’s disease have continued to rise. 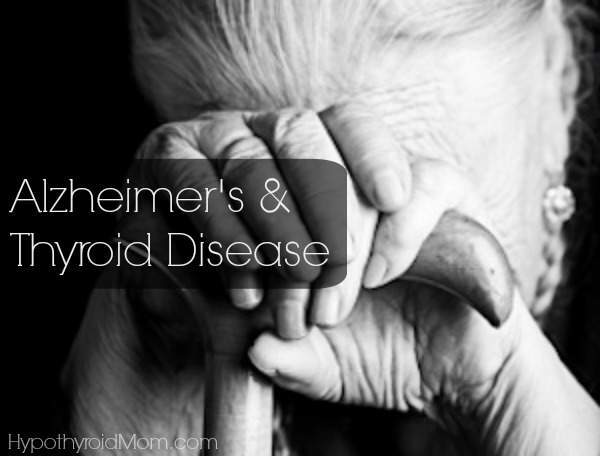 Growing evidence links thyroid dysfunction and Alzheimer’s disease. At the start of my undergraduate science degree in the late 1980s, I was fortunate to take a course with a professor who was passionate about neurobiology. The science of the brain was intriguing to me. I graduated with my Honors Bachelor of Science in Neuroscience. Alzheimer’s was a major topic of study in our program and an exciting one as the race for a cure was on. It amazes me that over 20 years later there is still no cure for this lethal disease. The Framingham Study is a longitudinal community-based observational study of participants who have been evaluated biennially since 1948 for cardiovascular risk factors. Over a follow-up period of 12.7 years, close to 2,000 participants from the Framingham Study were tested periodically for thyroid function using TSH (thyroid stimulating hormone) levels and tested for dementia using the Mini-Mental Status Examination (MMSE). In 2008 the findings were published in the Archives of Internal Medicine. Women with TSH below 1.0 and those with a TSH above 2.1 had a greater than two-fold higher risk of developing Alzheimer’s Disease. These findings should be considered hypothesis-generating and validated in other populations before clinical conclusions are drawn. The results are particularly disturbing given the ongoing debate over the normal reference range for TSH. The normal range used by many mainstream doctors for TSH is 0.5 to 5.0. According to this reference range, patients are not diagnosed with hypothyroidism and treated until their TSH reaches above 5.0. Then there are doctors worldwide who refuse to treat until the TSH reaches above 10.0. Given that this study showed TSH above 2.1 increases the risk of developing Alzheimer’s, there is great concern for women with thyroid dysfunction. Absolutely yes more studies should be done to validate these findings. The lives of millions are at risk. Given that every cell in the body including the brain requires thyroid hormones for proper functioning, it’s not hard to imagine how a disruption in thyroid levels has the power to affect the brain in Alzheimer’s. Don’t underestimate that little butterfly shaped thyroid gland at the base of our necks. Alzheimer’s disease begins destroying the brain 10-20 years before symptoms ever appear. By the time diagnosis is made, the disease has already destroyed nerve cells and tissue throughout the brain. Over time, the brain shrinks affecting nearly all its functions. Prevention is key. Take charge of your health. Be proactive and have your thyroid properly tested and optimally treated. Be aware of the 10 early signs and symptoms of Alzheimer’s and seek help immediately if you or someone you know shows these signs. 1. Alzheimer’s Association. 2012 Alzheimer’s disease facts and figures. Alzheimer’s and Dementia: The Journal of the Alzheimer’s Association. 2012 March;8:131-168. 2. Alzheimer’s Association. Alzheimer’s Myths. 3. Tan, Z.S., Beiser, A., Vasan, R.S., Au, R., Auerbach, S., Kiel, D.P., Wolf, P.A., Seshadri, S. Thyroid Function and the Risk of Alzheimer’s Disease: The Framingham Study. Arch Intern Med. 2008 July 28;168(14):1514-1520. Its really strange. I have hashimotos & my mother has Alzheimers. We have exact same symptoms. I told them to get certain bloods tested & they took the bloods with them to show to the dr. When I asked if they got them tested there was a pause & a ‘theres nothing wrong with her thyroid’ which made me think that they only had basic testing. I seriously believe that its all linked & now potentially because of a dr doing what that want to do & them believing a dr over anyone else she could have some more ease. Call me crazy but I’ve seen too much over the years to know what I’ve seen & pigmentation is one of the symptoms she has.